Those who have trail run the Rim-to-Rim-to-Rim (R2R2R) madness of the Grand Canyon know this: you leave a little piece of yourself in the canyon. 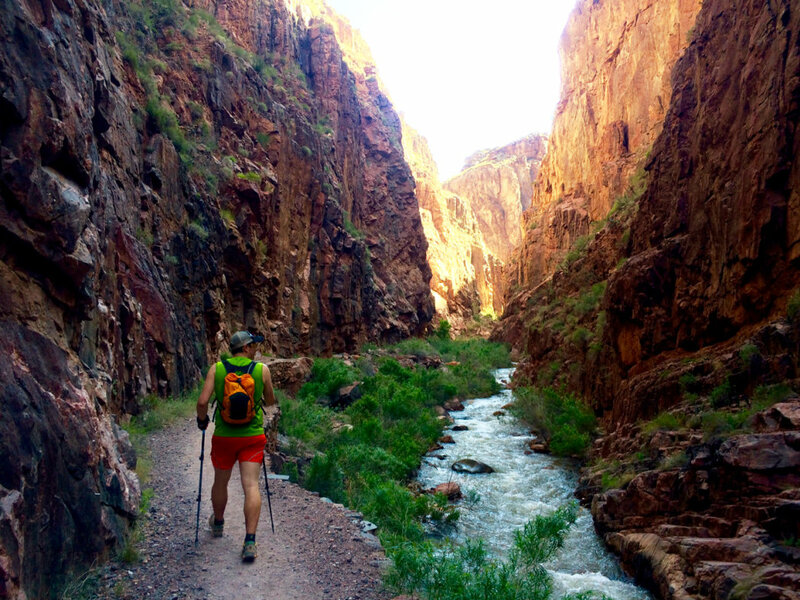 The 40-plus-mile route is a grueling out-and-back journey with more than 10,000 vertical feet of gain and loss, which travels from the South Kaibab Trail to the North Rim and back up the Bright Angel Trail. It’s an experience that is as challenging to the mind and body as it is rewarding to the soul. The feeling of elation that comes upon completion is unrivaled, and for anyone lucky enough (read: ‘foolhardy enough’) to do it, it’s a day that will live long in the memory. Running the Grand Canyon is not a year-round event. The majority, if not all, of those who run it do so during the months of October to November and March to early May, when temperatures are cooler and the trail is less-traveled. In fact, it would be wise to avoid attempting the R2R2R in summer months, as temperatures can rise to 120 degrees in the bottom of the canyon, where shade and protection from direct sunlight is minimal. In the heat of the summer, the run can, and has been, deadly, making the window of opportunity to run this audacious route extremely small. The R2R2R is no joke. This is not a fun run or even your average ultra marathon. This is one of the most intense courses you may ever experience, as the distance, elevation, and exposure are all extremely challenging. All around the Canyon Rim, signs tell visitors to not even attempt 1/2 of this route in a day. Therefore, serious training, full of hours of elevation gain, and long distances need to occur before you attempt the R2R2R. While water sources are available, many will be shut off depending on the time of year you visit. For the best info, contact the Grand Canyon National Park Backcountry office directly and let them know of your plans. You will also need to bring plenty of fuel for the run, whether it is your favorite trail snack, electrolytes, gels, or all of the above. You’ll burn thousands of calories and will need to constantly be hydrated. Be smart and be prepared. The key to success on a R2R2R run is all in the logistics. 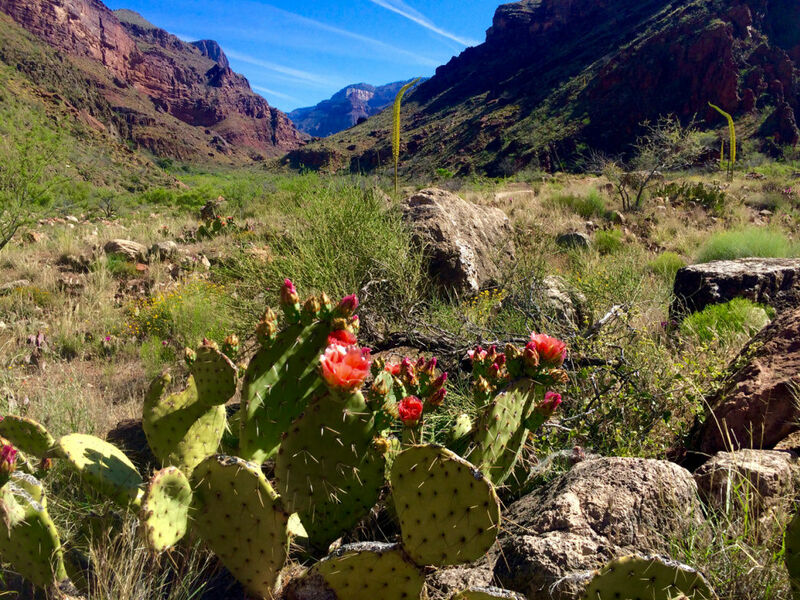 Starting around 6am, depending on the time of year, a free hiker shuttle leaves the Bright Angel region of the park (where most of the lodges and places to stay are located) and travels to the best place to start: the South Kaibab Trail. The short trip drops you off right at the trailhead, letting you immediately start your adventure without having to worry about parking far from the trailhead and walking a mile or so before you start the run. The backcountry office can tell you the schedule of shuttle buses, including the early morning hiking shuttle. 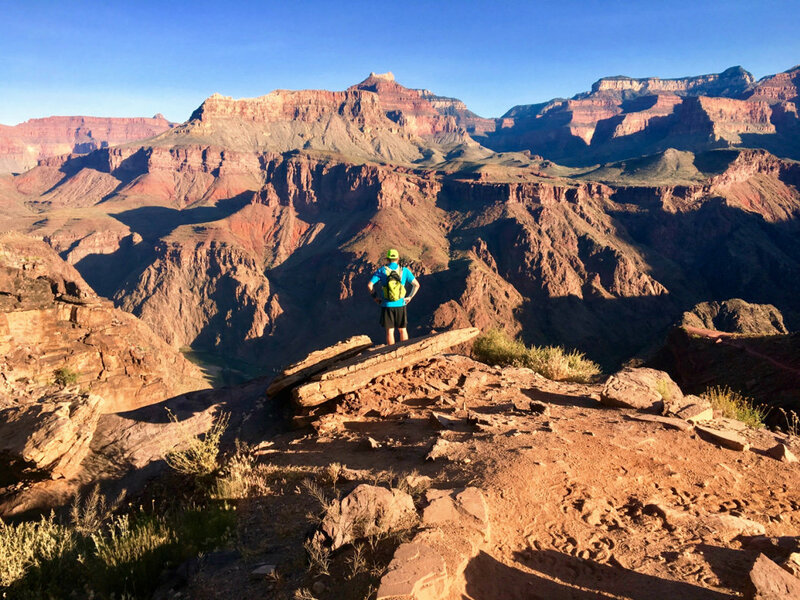 The first leg of the run travels down the South Rim of the Grand Canyon and is filled with adrenaline and excitement, with your shoes kicking up ancient dust as you gallop gleefully down the trail. This is the easiest section of the run, where you pass day hikers and mule trains on a long descent into the belly of the canyon. Within a mile of running, you’ll slow to a stop, taking in the sunrise at the correctly named Ooh Aah Point. Here, you’ll see a few people taking pictures and want to join them as they stand in silence, watching the first beams of light shoot into every rocky nook and cranny in the canyon below. Picking back up speed, uneven steps become a blur, replaced by the need to slow down and look around. Rounding corners and taking in the vistas around each bend of the trail, the 7.3 mile section down to Phantom Ranch flies by, thanks to a loss of about 4,800 feet over 6.4 miles to the Colorado River. With switchbacks and rock formations, playful shadows and a sense of adventure still fueling your legs, the run down is the perfect way to start this epic run. Once you reach the Colorado River, you’ll cross a suspension bridge and soon begin gaining elevation to the North Rim. The run meanders through the Bright Angel Campground before reaching the historic and ideal resting spot of Phantom Ranch. Full of tourists staying in cabins at the canyon floor, Phantom Ranch is like a truck stop of sorts, offering water, a bathroom, and if you time it right, food and drinks. However, don’t depend on this, as the times of serving non-cabin guests are only limited to a few select hours each day. 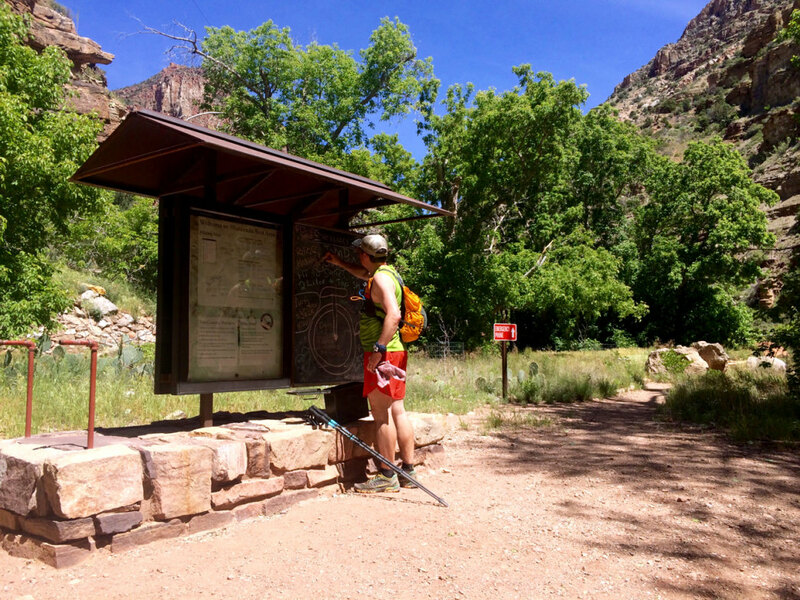 Instead, fuel up from your pack and head up toward Cottonwood Campground. Cottonwood Campground is 6.8 miles from Phantom Ranch, with over half of the distance weaving through a breathtaking side canyon that slowly rises in elevation and crosses a series of fun bridges. This section of the trail is wide and easily runnable, and provides a perfect reminder of the beauty found while powering through this long run. After about four miles, this tight canyon ends, emptying out into a larger canyon and offering up views of rock formations reminiscent of cathedrals and skyscrapers towering above the vegetation. This section also has little shade on sunny days, making the steeper sections of the trail seem even more brutal. As you work your way up and down small hills next to a cool creek, heat becomes an issue, and many begin to long for shade. Luckily, after passing Ribbon Falls, you only have 1.6 miles until a water source and a little bit of shade. From the Colorado River to Cottonwood Campground you’ll gain just over 1,500 feet of elevation. To Cottonwood Canyon, the run from the South Rim is pretty simple and not physically taxing at all. The heat and exposure right before Cottonwood Camp may have drained some energy, but nothing can compare to the brutal assault that lies ahead. In the next 6.8 miles to the North Rim, you’ll gain 4,200 feet, with the majority coming over the last 4.7 miles. From Cottonwood, the next 1.4 miles fly by despite the 600 feet of elevation gain, with views becoming more canyon-like as you get to the Manzanita Rest Area. Here, you’ll find a few benches, some state of the art bathrooms and a chalkboard, where other hearty trail runners have written their names celebrating their journey. As you see the names of incredible athletes written on the board, take a breath, enjoy the sights and appreciate the calmness before the storm—you are about to climb up. After Manzanita, you’ll start climbing to the North Rim via a scenic and stunning section of trail. 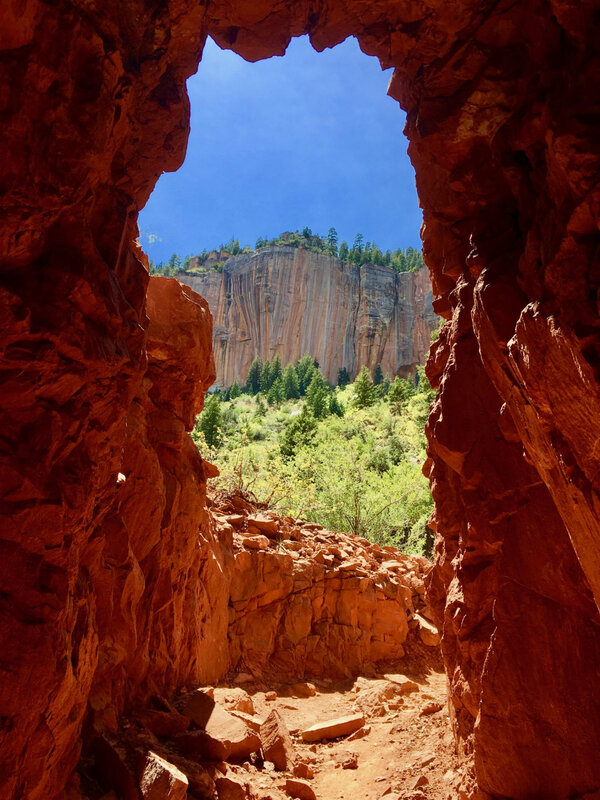 In just 0.7 miles, with 600 feet of elevation gain, you’ll run alongside Roaring Springs, a waterfall appearing from a hole in the rock and pouring down the cliffs across the canyon to your right. Enjoy this view for a few extra minutes. From here the trail enters one of harder sections of the run, a 4.7-mile slog, guaranteed to burn your quads and test your mental wherewithal. For the next three miles until you reach Supai Tunnel, you’ll climb almost straight up at times, gaining 1,600 feet while running on exposed ridges, rocky switchbacks, and across a bridge. It is this section, before Supai Tunnel, where many will feel that they have nothing left. The tunnel seems like it will never arrive, but after crossing a bridge and working up a few switchbacks, the hole in the rock is visible, giving you a resting spot before the last 1.7 miles. Over the next section to reach the North Rim, you’ll continue to climb, gaining 1,400 feet. With a few awesome viewpoints to distract from the exhaustion in your legs and brain, this is where all of your training will carry you to the top. Step after step, reaching the top slowly becomes a reality, before finally cresting the lip of the canyon and spilling out into a forest of pine trees above 8,000 feet. At the North Rim, the feeling of accomplishment is incredible. While the views here are minimal, your legs have carried you across the width of the world’s most heralded canyon, gaining over 21.5 miles. 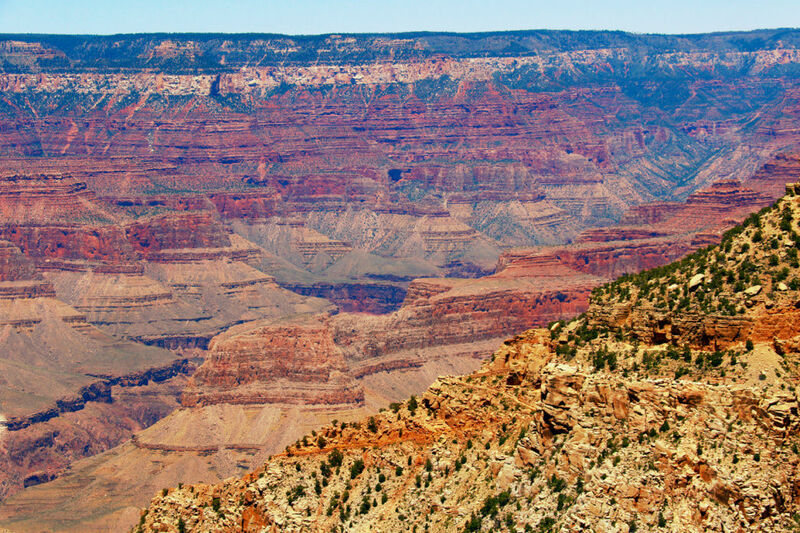 For some, reaching the North Rim is a cause for celebration; for others, it induces knowing anguish: You must now return to Phantom Ranch and climb back toward the South Rim. The descent is much easier than the journey up to the North Rim, letting you relax and stretch out your overworked quads, passing the numerous viewpoints and stops you took while running the opposite direction. In what seems like minutes compared to the run up, you’ll reach Cottonwood Campground, then work your way back to the picturesque canyon before the Colorado River. Weaving through the tight rock walls, this section of the trail often drags on, as the anticipation of reaching the river consumes your thoughts. Eventually, you reach Phantom Ranch, before once again crossing the Colorado River on a suspension bridge, this time heading up toward the Bright Angel Trail. From Phantom Ranch to the South Rim, the run is just 9.9 miles in distance, but it gains over 4,000 feet. The first two miles are simple, running with no elevation gain along rocks and loose sand, right next to the beautiful waters of the Colorado. Not before long though, the trail heads up—gently at first. Over the next 3.2 miles, the gain is minimal, climbing around 1,400 feet. However, heavy legs are common, making the final climb out of the canyon seem much longer and more steep than it actually is. Mentally and physically exhausted, the run continues, with the realization of being just a few miles from the top starting to kick in. At Indian Garden Campground, the South Rim becomes visible, looming like a beacon of hope 3,000-feet above you, just 4.8 miles away. Endless switchbacks wear down the last of your leg reserves, forcing runners to dig deep and take breaks while gazing behind them at the stunning canyon walls. If you’re lucky, there will still be daylight. If not, you’ll be heading up this part of the trail in darkness, with only a headlamp to guide your way along this wide, steep trail. With the sounds of frogs in every direction and insects crawling across the trail, dusk and darkness along the canyon turns the experience into an otherworldly surreality. Switchback after switchback, you climb closer to the South Rim, churning your legs with everything you have. Exhausted, tired, and covered in sweat, the trail reaches the last few switchbacks, passes through a tunnel, and finally spits you out on the paved path on top of the South Rim. Surrounded by signs of civilization and the smells of food, have one last gaze back to the north, and take it all in. You’ve just completed one of the most grueling and awe-inspiring runs in America. You’ll be met with an emotional cocktail comprised of equal parts elation and exhaustion. And while you’ll undoubtedly feel an overwhelming sense of pride and accomplishment, these feelings will be outweighed by a profound humility and reverence for the scale and scope of your surroundings. After all, this is the Grand Canyon, and you’ve just completed the most intimate tour that one can have through its majesty—one that few people have had.